Writing practice is an important part of learning Chinese for all learners except perhaps true beginners and those who have chosen to focus only on the spoken language. Writing can work as stepping stone to more advanced speaking, as well as a less scary way of trying out new words or expressions. It can also help you figure our where you have problems with grammar and vocabulary. When you write, your errors become obvious, which is good because you can then do something about them. Read more about learning to write in Chinese here. 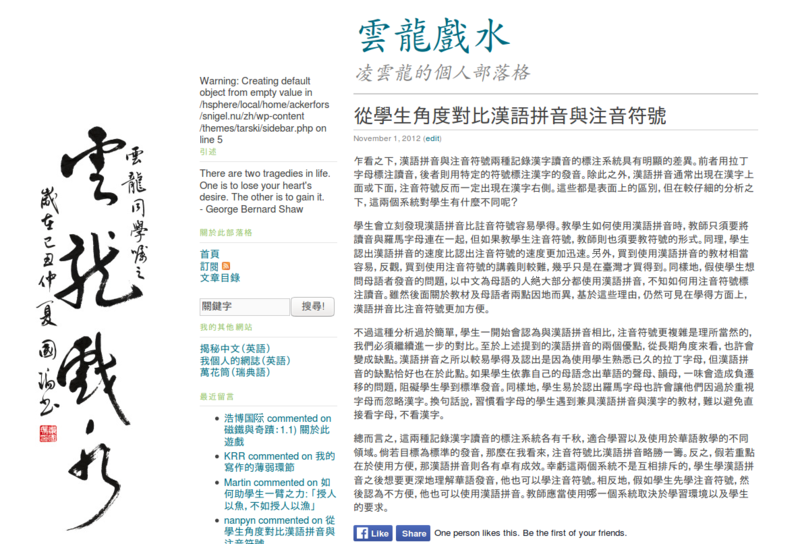 In this article, I’m going to suggest that you start blogging in Chinese. This will make it easier for people who want to help you and you can also use it as benchmarking later. It doesn’t matter how much you write or what you write about, just do it! Structure and routine – Set a schedule and stick to it. Don’t be too ambitious, but be strict when it comes to following the schedule. Writing once a week is a reasonably minimum. This doesn’t mean that you acan’t write more if you want, it just means that you set a decent level of minimum output. Feedback and comments – You should of course try to get as much feedback as you can from friendly native speakers or other people who are interested in helping youout. I have used Lang-8 a lot for this. Having the text online makes it easir to refer to and you know you have your texts in one place. Accountability – This is an important part in getting things done. If you announce your schedule to someone who cares about your progress, you will feel a healthy social pressure to actually post something. If you write interesting things or know a lot of people, this might happen of itself, but don’t hesitate to ask friends or family to hold you acountable even if they can’t read Chinese. Communication – While writing a blog is mostly a unidirectional activity (you write, someone else reads), there is a difference between writing on your own computer and publishing online. The fact that someone might read it increases the requirements to write clearly. Naturally, you might also get comments or questions from readers. Benchmarking – When you have studied Chinese for awhile, you will enter the “intermediate plateau”, where it feels like no matter how much youstudy, you don’t really learn much. You do, thugh, it’s just that you might not notice. One way of getting around that is to benchmark properly. Writing a blog makes tht a lot easier and is indeed a form of benchmarking in itself. Starting a blog is easy and free unless you want a fancy solution. I’m not going to go into the details of how to set up a blog on your own (check this article or this website), but make sure whatever service you choose is accessible in China if you plan to show your blog to people there. If you start a blog to practise your writing, why don’t you let us know about it by leaving a comment below? Wouldn’t it be cool to be able to look back on your progress a couple of years from now? 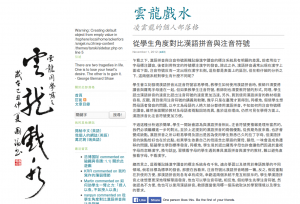 I’ve run a blog in Chinese since 2008, so let’s use that as an example. I had honestly forgotten about half of these articles, so writing this post took twice as long as expected because I got stuck reading through them. Naturally, you don’t need to make your blog publicly available if you don’t want to! Just don’t give out the address or password protect your posts if you want to. This is a great opportunity to start your blog (or restart it if you already have one). If you do, don’t forget to leave a comment. Good luck! Yeah, although for my personal idea, I wish to discuss advanced topics that I have pondered for a long time, so I will likely write out an essay first, post it somewhere like lang-8 or show a friend, then make the video. For example, having read Fact and Fantasy by John Defrancis, I think that chinese characters are actually not necessary at all, but that speakers or learners of languages that use chinese characters adopt this “fantasy” that they are necessary. E.g., Japanese and Korean are very similar languages, but Japanese uses Chinese characters and Korean uses a phonetic script without issues. So I’m also reading 思考，快與慢 in Mandarin in order to discuss those ideas. (Sorry, I’m kinda using my posting here to help give myself a commitment to going through with it). Writing,definitely is a great and to the point way of improving Chinese as a whole, because you are so intensely concentrating to make fewer mistakes than when you do while speaking. Sometimes though,translating using a dictionary is quite tricky. Synonym study becomes a very important,as a result that it may even hamper the actual process. If a person is thinking to start learning Chinese, then he must definitely go fir it, learning Chinese and mastering it opens doors to nearly one-fifth of the world’s population as well as to one of the strongest economy of the globe. I appreciate your efforts in writing such an amazing article. Keep up the good writing. Cheers. “Why you should start blogging” has a lot of reasons. However, when is all upto you. When you can commit yourself to blogging, is the time you start blogging. Thanks for the article! A lot of good points here. Would you recommend any hosting service in particular for mainland China? No idea, really. I mean anything works, as long as it isn’t blocked, of course.